“I give up. I will never get of debt.” Most people say that, but outstanding debt can lead to financial ruin for a period of time and depression. Yes, depression. Overwhelming debt can make you feel hopeless and ashamed, but remember that most people have had financial difficulties in their lives. Remember that there is always a solution, and you too can be debt free. Let me briefly pause for a minute and explain to you my definition of debt free. Debt free doesn’t always mean not owing anyone. You will always owe someone. A good example is property taxes. If you don’t have a mortgage, that’s great. But what happens if stop paying property taxes on the on the property you house sits. You never thought of that, did you? So what happens when you don’t pay your property taxes? The county takes your property, including your house. Yes, the house, which includes the total value of the property as well. Debt free means freedom from unnecessary debt. Unnecessary debt is debt that you don’t need, such as numerous credit cards, outstanding medical, cable or satellite, and student loans. 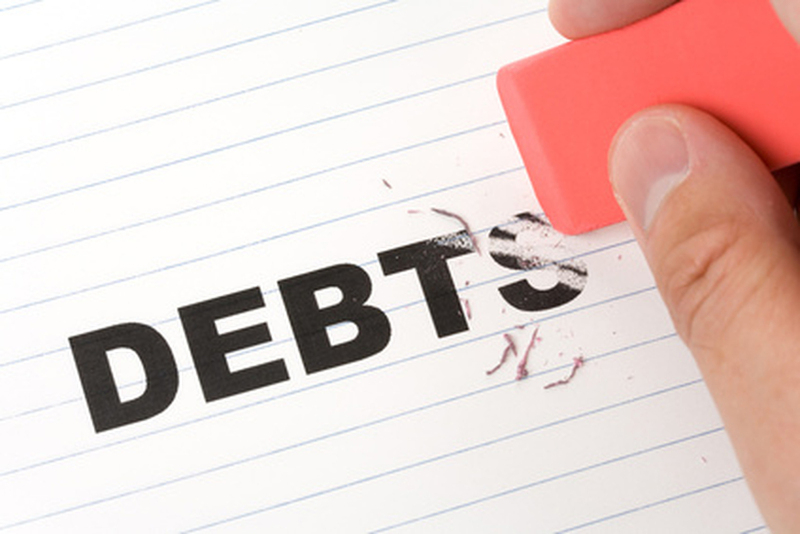 There are certain debts that you will have regardless of your income. These types of debts are called fixed expenses, which include mortgage/rent, car note, health and life insurance, and homeowners insurance. You will have some of these fixed expenses you die. What about student loans? In some cases, yes, student loans can be a fixed expense. However, you must determine whether or not you need student loans to finance your education. If you don’t need student loans, don’t get them. If you have to get student loans to finance your education, borrow responsibly. Only borrow the exact amount you need to pay for outstanding institution balances. Most college students borrow more money than the need to pay for college. They are only looking at the here and now, and over borrow to have money to pay off other debts. In other words college students borrow money than they need for college to rob Peter to pay Paul. That is why I am in over $80,000 in student loan debt. My student loan debt would be close to $50,000 if I didn’t borrow more than I needed. Now I am paying for it. But like me, you can kick unnecessary debt in the…you get the rest. The first thing you need to before following the following steps is to be determined to control your debt. Why? If you have to ask that question then you need to stop reading this article. Debt doesn’t go away on its own. You have to make your debt go away. 1. Calculate how much you spend. The first thing people say is, I don’t have any money to pay off my debts. How do you know? Be honest with yourself. Write down a list of all of your monthly outstanding debt, excluding fixed expenses. Secondly, write down your monthly net income. If your monthly expenses are more than your income, you should readjust your budget or get a second job for at least six months. The next step you need to take is to determine what you need and what you think you need. This means that you may have to cut back purchasing things for a while. For example, if you spend $100 a week to get a pedicure and manicure, do your own nails. You will save $400 a month that can go toward a bill. I discontinued my cable services and purchased Netflix and Hulu, saving over $200 a month - That's a serious savings! 3. Create a budget and stick to it. Make a budget and stick to it. This will help stop spending money on frivolous items. For example, eat out once a week instead of five days a week. Learning how to manage your money well make you think twice about spending. 4. Pay off as much as you can. Now that you have tracked you monthly spending and expenses, cut out unnecessary spending habits, and created a budget, start paying off your outstanding debt. If you a little extra money after you pay your monthly fixed expenses, start paying off you debt, smallest bills first. For larger outstanding monthly unnecessary debt, call your creditors to see if you can start a monthly payment plan. The goal is to not file bankruptcy. Bankruptcy should always be the last resort. If you have to file for bankruptcy, seek an attorney to help you decide whether or not bankruptcy is the best choice for you. Bankruptcy can drastically decrease your credit score. But it can help your start rebuilding your credit.